Do you want to improve the curb appeal of your home? One of the best ways to do it is by coming up with a great landscaping design. You’ll be amazed by how a few trees, some flowers, and a well-manicured lawn will change the way the outside of your home looks. But before you start landscaping, there are some common mistakes you should avoid at all costs. Read about them below. 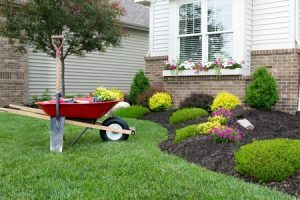 You would be surprised by how many homeowners set out to add a landscape design to the exterior of their home without coming up with a plan first. They run out to the nursery and buy a bunch of trees, flowers, and other plants that look nice but don’t know exactly where they’re going to put them. Then, they start to piece together a plan on the fly while getting the tree, flowers, and plants into the ground and wonder why their design doesn’t look as good in the end as they hoped it would. Mapping out a plan from the beginning will help you avoid this scenario. When you’re creating a landscaping design, it’s good to get a healthy mix of all kinds of different trees, flowers, and plants into it. But you should make sure that all of them are suitable for your climate before you put them into the ground. You should also check to see how much maintenance they’ll need from you. This will prevent you from having to come up with a new landscaping design soon after your original plants struggle to survive. Once you put a landscaping design into place, it’ll be up to you to irrigate your plants and keep them alive. Think about if you have enough time to do it before you landscape your yard. You might want to consider installing an automatic irrigation system if you find that you’re not going to be able to commit to watering and feeding plants on your own. This will obviously be an additional cost, but it could be well worth it when you factor in all the time it’ll save you. If you’ve never created a landscape design on our own, it’s a good idea to seek out assistance from the pros. VistaPro Landscape & Design can help you revamp your yard and supply you with the landscaping design you’ve always dreamed of. Call us at 301-805-0119 in DC Metro, 410-878-2100 in Annapolis, or 703-652-4545 in Virginia to schedule a consultation.